41. Understand the pros and cons of bird feeding. Feeders provide humans with the opportunity to see and enjoy backyard birds and learn about their habits. 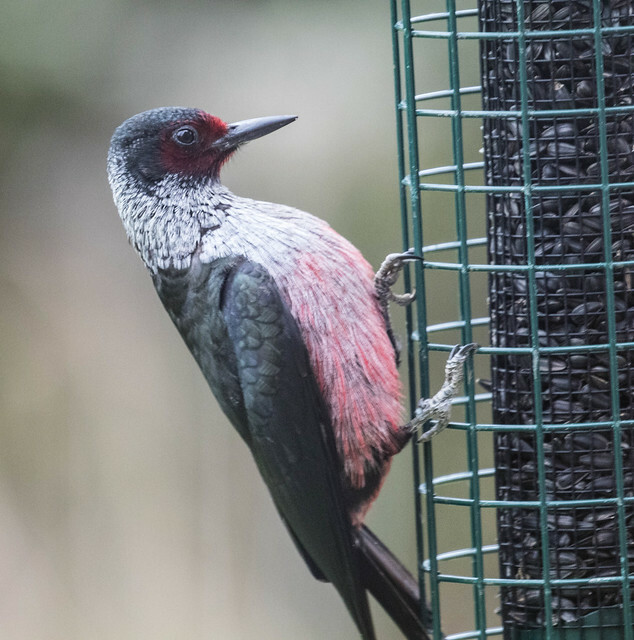 Most people who become involved in conservation first recognized the importance of birds and other natural resources because of intimate encounters with individual wild animals, including birds at feeders. 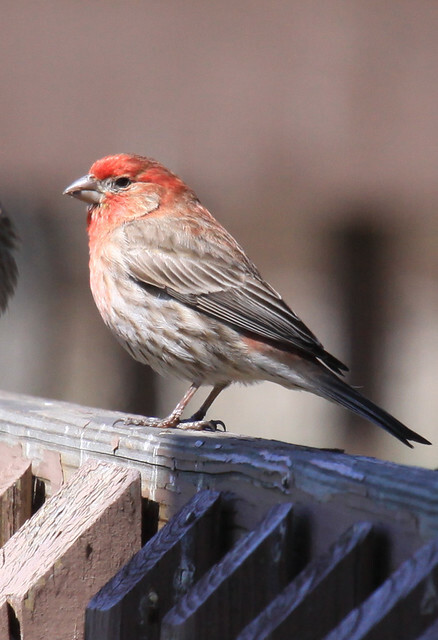 And feeders have provided ornithologists and resource managers with data to track the spread of diseases, such as conjunctivitis in House Finches, and an easy way to monitor the distribution and abundance of many species. A lot of valuable data are obtained from “citizen science” projects that involve observation at feeders, such as Audubon’s Christmas Bird Count and the Cornell Lab’s Great Backyard Bird Count and Project FeederWatch. Clearly, bird feeding adds to our understanding and knowledge of birds, aiding in conservation. Bird feeding also helps individual birds directly, providing them with easy food resources during extreme weather and food shortages and keeping some birds alive that would otherwise die. During the cold, wet month of May 2004, a huge variety of birds took refuge in my backyard, including several species seldom found at feeders. 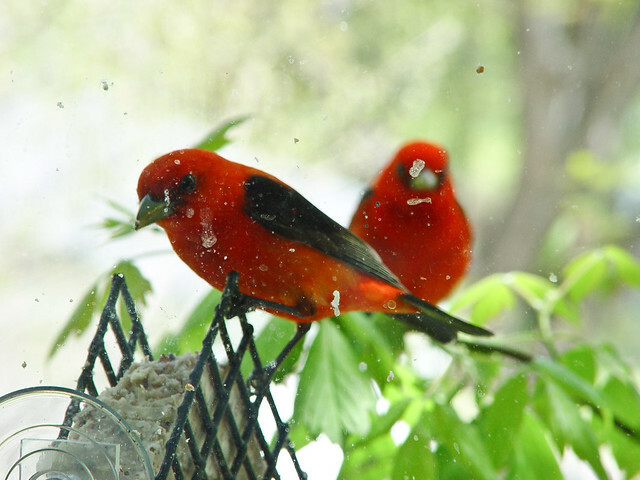 As many as five Scarlet Tanagers, seven Baltimore Orioles, thirty Cape May Warblers, and even a Bobolink spent days or weeks in the yard. So few insects were available at the time that people hiking through northern forests in Minnesota were finding dead insectivorous birds that had apparently succumbed to starvation. Feeders also provide temporary safe harbors for migrants that have wandered out of their normal range. 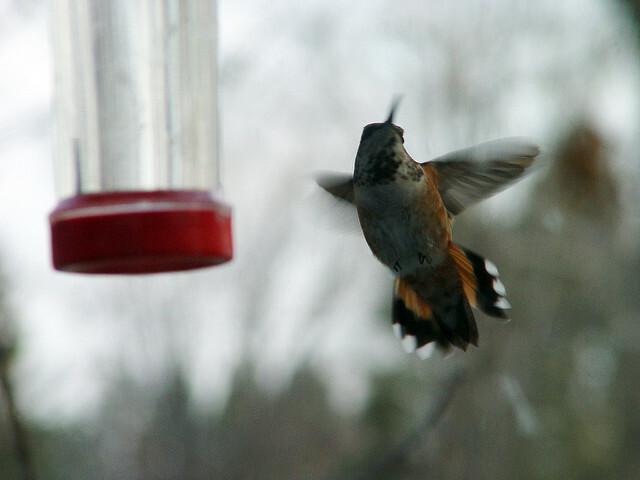 When a Selasphorus hummingbird (either a Rufous or an Allen’s Hummingbird) appeared in my yard, far out of her range one cold November day, she was clearly hungry, in no condition to fly the 2,000 miles to reach her species’ normal winter range without replenishing her body’s reserves. She remained for sixteen days and then disappeared at mid-morning on December 3, when the temperature reached the twenties and was warmer in the southeast, the direction she was presumably headed. I’m afraid that if she didn’t encounter any more feeders, she probably didn’t survive long enough to get to her proper wintering range. Desperate birds like this one may take refuge at feeders and may even borrow time at them, but the feeders didn’t entice them out of their normal range or cause their ultimate demise. And in some cases, such as the warblers visiting my yard that cold spring, feeders probably keep some healthy but cold and starving birds alive until springlike weather finally comes. A young Ruby-throated Hummingbird stopped at my feeder for a long feeding bout one October day, long after others of its species had left northern Minnesota. That bird had probably hatched late and was behind schedule preparing for migration, but once its body was primed for travel, it stayed focused on the journey, stopping only for a meal before zipping off again. Very few hobbies provide so many benefits and pleasure to both people and wildlife while causing so little harm to either. Because feeders often become gathering places for large numbers of birds, and because they provide food resources that can give local birds longer life spans and greater reproductive success, bird feeding may be a tool for wildlife managers. 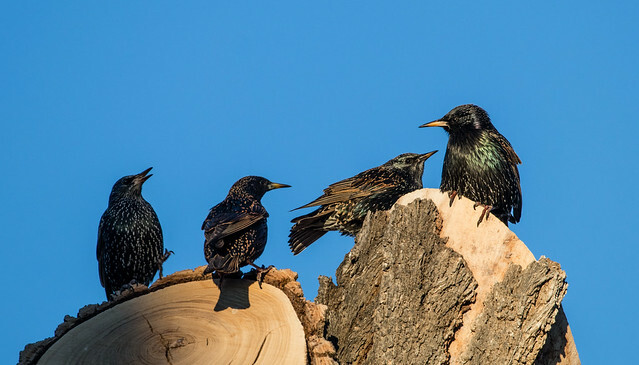 For these same reasons, feeders may subsidize invasive nonnative birds, and native species whose populations are too high and, in rare situations, foster the spread of disease organisms. Those of us who feed birds must recognize these potential problems and work to actively prevent them. In some serious local or regional situations, bird feeding may need to be regulated. One of the most important concerns about bird feeding is subsidizing problem species, especially exotics such as European Starlings and House Sparrows and overabundant native species such as Ring-billed Gulls, Canada Geese, and some blackbirds. Hand-feeding pigeons, ducks, gulls, and geese at urban and suburban parks provides great pleasure for some people and benefits both people and wildlife by fostering sympathy and affection for the latter. But doing so can also contribute to their overpopulation, creating a nuisance for other people and hurting other species and natural habitat. Concentrations of ducks and geese in urban parks can add significantly to the nutrient and bacteria loads of local beaches. 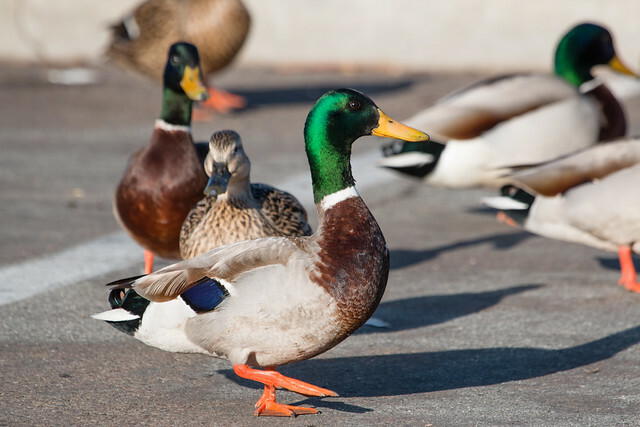 And feeding in early winter can entice some urban ducks to remain in an area longer than is safe. In the winter of 2003, dozens of ducks died overnight when ice formed rapidly in a little inlet of Lake Superior near a city park where many people fed them. Perhaps these birds would have moved on earlier if they hadn’t been so dependent on people for food, but since most urban duck populations include Mallards from domestic duck stock (as did this particular flock), it’s uncertain whether these birds would have migrated, regardless of feeding. Because individual towns and cities have specific bird population issues and different local attitudes, regulations or prohibitions about feeding in public parks need to be addressed on a case-by-case basis. Feeding bread to ducks and geese is actually dangerous—it loads them with carbohydrates while not providing essential nutrients. Growing young waterfowl can develop crippling deformities such as “angel wing” when they don’t eat a well balanced natural diet. 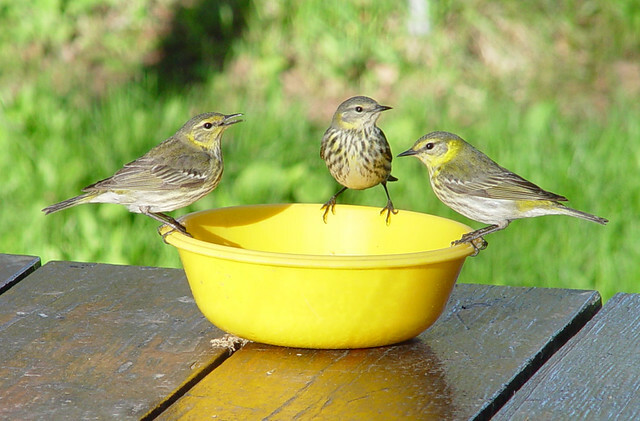 Backyard feeding is unlikely to cause the vast majority of wild birds to remain in a location longer than usual, although feeders do provide food for individuals whose migratory timing or route varies from the norm and injured birds that aren’t capable of migration. Stray orioles, thrashers, and some others may remain at feeding stations well north of their species’ typical range for an entire winter. Many of the rarities found on Christmas Bird Counts are birds that remained farther north than their normal range and are regularly visiting feeders. But orioles, thrashers, hummingbirds, and most others time their migration for the weeks when natural food is most abundant rather than when food is starting to disappear. So food availability is not the deciding factor that keeps individual wild birds past their normal departure time, especially long-distance migrants. 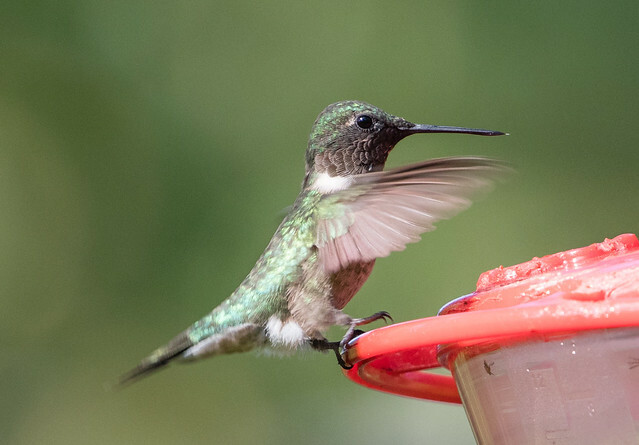 Some hummingbirds that find themselves north of where they “belong” in early winter may take refuge at a feeding station, but without that feeding station, they’d simply die unnoticed. Some birds that linger may be injured, but most birds overwintering north of their “typical” range simply represent a normal variation within their species. Many short-distance migrants such as blackbirds, juncos, and native sparrows are wintering north of their historical winter ranges because of changes in agriculture, habitat, and climate. A few non-migratory species such as cardinals, titmice, and Red-bellied Woodpeckers have been steadily extending their year-round ranges northward in recent decades. Bird feeding contributes to the survival of individuals, so it has certainly played a role in their gradual range extension, but it hasn’t been the only or even the primary factor. For example, cardinals have been expanding northward since the 1800s, possibly because railroad track right-of-ways were kept cleared of snow, where grain occasionally spilled. And ornamental trees and shrubs planted in cities and towns have played an important role in changing bird distribution.